What’s a BIOS you ask? The term BIOS, or Basic Input/Output System, originally referred to a specific type of interface between a computer system’s firmware and its operating system. However, among consumers, the term BIOS has evolved into a term used to describe any interface between firmware and operating system. Some PC-based systems now use Unified Extensible Firmware Interface (UEFI), however most systems still use the BIOS interface. Recently I purchased HP Envy TouchSmart J0137tx with the hope that i’ll get started with Windows 8.1 Mobile Application Development. But it wasn’t as easy as i thought it would be. The issue started with the problem in the RALINK Bluetooth and LAN hardware device, which for some reason didn’t allow virtualization to work. When ever i enabled virtualization my notebook would get stuck on the load screen for an infinite time untill i restored it to the previous image. With the hope that i might only be person facing this problem i did some googling and came acroos 100s of post where HP users were complainig about this issue. Some threads were even dated as old as the year 2012. I was shocked. I just spent 1300$ on this machine and for one purpose and it all is going in vain. I contacted HP support, and i am sorry to say the worst support i have seen so far, the people there didn’t know what virtualization is. What a BIOS version is? How to Flash BIOS? etc.. Like all other blogers out there i lashed out on HP commenting and mailing people from HP and no solution, there came a time just couple of days back when i almost gave up and was planning to sell my machine. Since it didn’t serve the purpose. And today after almost a month the HP Support Assistant prompts me with such a news that my happiness knows no bound. 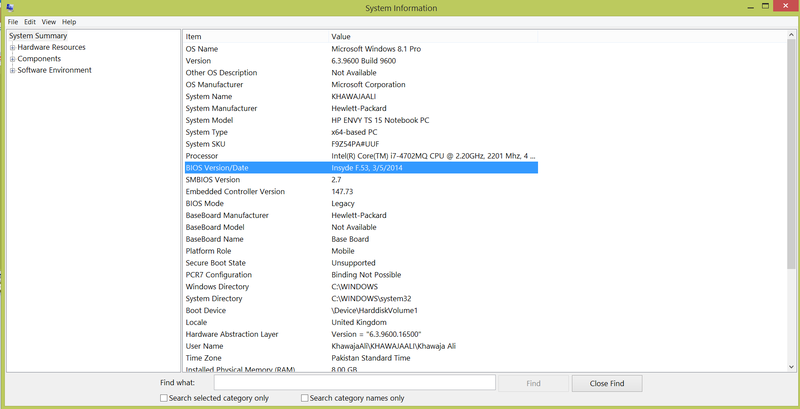 Determine the BIOS version in Windows 8 using the “msinfo32” command. Locate the BIOS version/date entry in the items column. Enter your device model number and search. Find your device. Under the heading of BIOS you’ll find the update. Download it. It will prompt you that you wish to continue or not. Click Yes. When your system will boot it will not find any boot media, now restart and TAP F10 or F8 which ever opens the Boot manager for your device. Go into boot option and set boot priority back to Legacy. And save setting and you’re good to go.